We’ve had a weekend guest. One of our oldest friends, who was at medical school with my husband, came down on Friday evening so that he could go walking in the Wiltshire countryside with my husband on Saturday. His wife couldn’t come this time because she’s a busy GP and was doing a Saturday surgery. While the men were out all day I had a lovely time pottering about in my kitchen. I didn’t spend the whole day indoors (morning: farmers’ market; afternoon: took Son3 to the station) but it was so dark and wet outside, I wouldn’t have complained if I had. I’m a big fan of the series “How to make the perfect…” written by Felicity Cloake in the Guardian. She cooks popular dishes by well known cooks and chefs in an attempt to arrive at the “perfect” version. Her efforts are written up in detail and make excellent reading. I would urge you to check it out and I think most of the recipes are available via the Guardian website. Last night I made her chicken tagine and we absolutely loved it. I made a couple of adjustments though. First, I could not find saffron anywhere in Bristol. Okay, admittedly I didn’t try every single shop but you know what I mean. Therefore I threw in a teaspoon of ras-el hanout instead. This is not an exact substitute, obviously, but seemed to me to be an authentic addition. Secondly, I used green olives instead of violet ones because I love green olives and felt they were just right in this dish. Now, I’m sure you Aga cooks out there are dying to know how I cooked it. Well, I started the onions on the simmering plate and then transferred them to the simmering oven for a while to soften before adding the spices and remaining ingredients. Once I’d added the chicken thighs, olives and water I let it all come up to simmering point on the simmering plate, put a tight lid on and transferred it to the simmering oven. I reckon it could have stayed there for two or three hours but was cooked after one. As you know, little harm comes to anything left indefinitely in the slow oven of an Aga. A couple of things. I used less water than the recipe prescribed, perhaps just 100ml. I was taught at an Aga demonstration I attended when mine was first installed that you always need less liquid than the recipe demands because it simply doesn’t evaporate in an Aga to the same extent as in a conventional oven. And finally, I want to mention how much I love that in this recipe you don’t have to brown the chicken pieces in advance. In fact, browning meat might be my most hated cooking-related activity, because it always makes a mess with fat splashing everywhere, including in my hair. Anyway, I will definitely be using this recipe again, and, I hope, with saffron in it, unless there’s some sort of worldwide shortage I haven’t heard about. 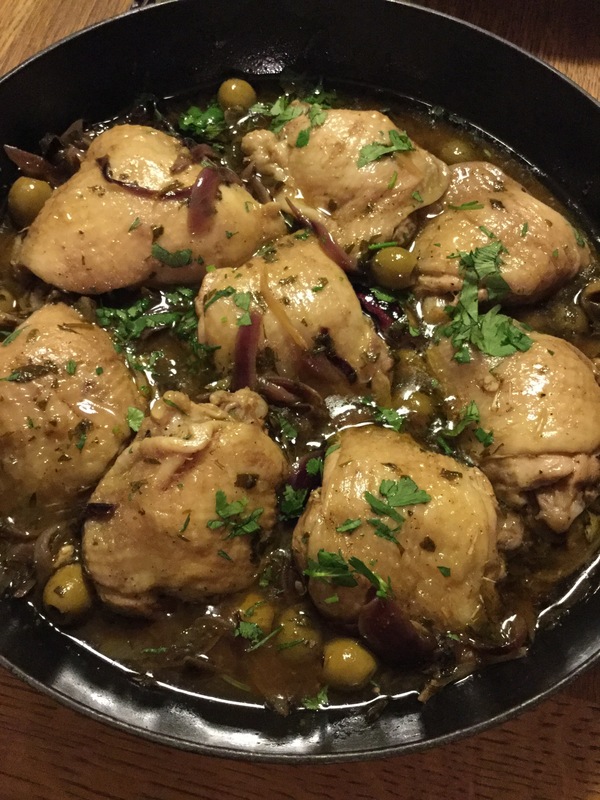 This entry was posted in Uncategorized and tagged Aga, chicken, olives, tagine. Bookmark the permalink. Also, we have loads of saffron hereabouts. Shall I send you some?